Writing on "Life, Money & Illusion"
Indicators are powerful. What we count and measure reflects the values of our society and literally determines what makes make it onto the policy agenda of governments. We currently gauge our well-being and prosperity according to a completely materialist measure -- our economic growth rates. Small changes in the gross domestic product (GDP) and related market statistics send an adrenaline rush down the veins of policy makers. Our language reflects these values. The more we buy and sell, the more rapidly the economy will grow, and the "better off" we are assumed to be. Leaders and journalists call a growing economy "healthy," "robust," and "dynamic." If people spend less money, consumer confidence is "weak" and our economy is in "danger" of slipping into a "recession." But these measures send inaccurate and even dangerous signals to policy makers. The more trees we cut down and the quicker we do so, the faster the economy will grow. The more fish we sell, the more fossil fuels we burn, the more rapidly we deplete our natural resources, the faster the economy will grow. So long as we measure "progress" like this, we will not translate pious homilies about "natural resource conservation" into action. In fact, counting the depletion of natural capital assets as gain is simply bad accounting, like a factory owner selling off his machinery and counting it as profit. Our growth rates also make no distinction between economic activity that creates benefit and that which causes harm. More crime, more pollution, more accidents, more sickness, more natural disasters all make the economy grow, simply because more money is being spent. In fact, sickness is far better for the economy than health, because sick people spend more money on doctors, drugs and hospitals. The Exxon Valdez contributed far more to the U.S. GDP by spilling its oil than if it had delivered its oil safely to port. And the Littleton Colorado massacre fueled the economy by forcing schools to invest heavily in video surveillance equipment and security guards. While our economic growth measures count many harmful things as "progress," they completely ignore genuine contributions to well-being, like voluntary work, simply because money is not exchanged. If we hire a stranger to look after our child, the economy grows. If we care for our own child, it has no value in our current measures of progress. The economy can also grow even while inequality and poverty increase. It grows if we work longer hours: free time has no value in measures of progress based on the GDP. The economy even grows if we produce shoddy goods that have to be replaced more often; and it grows if we produce more waste. Scientists warn that the only biological organism that shares the human economic dogma of limitless growth is the cancer cell. In general, nature thrives on balance and equilibrium. In sum, economic growth rates are an inadequate, misleading and even dangerous measure of well-being and prosperity. Fortunately, there are better ways of measuring progress. The Genuine Progress Index (GPI) assesses the health of our natural resources and environmental quality; it assigns explicit value to unpaid voluntary and household work as well as to paid work; and it counts sickness, crime, pollution, and greenhouse gas emissions as costs not gains to the economy. Unlike the GDP, in which "more" is always "better," less crime and less pollution make the GPI go up. Greater equity and more free time make the GPI go up, as does greater livelihood security, better health, and improved educational attainment. The 20 social, economic, and environmental components of the GPI reflect consensus values in our society, as determined by more than a year of extensive consultations with government, private sector and community groups. It is not only a more accurate and comprehensive measure of progress than we currently have, but can subtly change the policy agenda to reflect social, human and environmental concerns as well as purely materialist ones. At present we have no way of knowing whether we are really leaving the world a better place for our children or not, or of knowing whether we are better off now than we were 20 years ago. Certainly we have more "stuff," -- more cars, more home entertainment equipment, bigger houses. But if we are concerned about the natural world our children will inherit, about the strength of their communities, about their health and security, we need better measures of progress. The GPI is dedicated to that task. Developing the Genuine Progress Index is a five-year project. Seven of the 20 components have been completed, and work is currently under way on eight more. . Efforts are focussed on developing a comprehensive, practical and policy-relevant index for Nova Scotia as a pilot project for Canada. Each component is design for ease of replication by other jurisdictions. Your membership in GPI Atlantic will help sustain the extensive research effort that is necessary to complete the index. At a forest symposium at Dalhousie University, GPI Atlantic released figures showing that Nova Scotia has lost almost all its old trees in the last 40 years. In 1958, 24% of forest area had trees more than 80 years old, and 8% had trees more than 100 years old. Today, less than 2% of Nova Scotia forests have trees over 80 years old, and less than 0.2% have trees more than 100 years old. The area clear-cut has doubled since 1992. The GPI results were featured on CBC national radio and in several CBC interviews. The full GPI forest accounts will be released later this summer. The most recent GPI Atlantic population health report found that obesity costs the Nova Scotia health care system $120 million every year in direct costs and another $140 million in lost productivity. Across Canada, obesity rates have doubled since 1985 among both adults and youth, with serious health consequences. The 50-page GPI report, prepared for Cancer Care Nova Scotia, examines best practices throughout the world, and recommends concrete steps to improve population health and turn back what the World Health Organization has labeled a "global obesity epidemic." The GPI results were presented to health officials and received front-page newspaper coverage in Nova Scotia. To order this report, visit the GPI web site at Error! Bookmark not defined. GPI Atlantic's 60-page statistical portrait of Women's Health in Atlantic Canada, prepared for the Maritime Centre of Excellence for Women's Health, was presented to health officials in all four Atlantic provinces in February and March. The GPI results made front-page news on International Women's Day. Order the report on the GPI web site at Error! Bookmark not defined. The N.S. government plans to cut 1,600 jobs from the civil service. But the province could dramatically reduce its massive deficit without layoffs, says a report presented to the government and public employees' union by GPI Atlantic. The 30-page study found that offering a wide range of voluntary work reduction options to N.S. civil servants could save the equivalent of nearly 4,000 full-time jobs, with far less harm to service delivery than is caused by layoffs. Savings through voluntary work reduction would be greater than from layoffs, because layoffs increase taxpayer costs in employment insurance, social assistance payments, a reduced tax base, lost production, high severance and early retirement costs, and a range of indirect health and social costs associated with layoffs. Unlike layoffs, voluntary work reduction also retains valued skills in the public sector, ensuring better service delivery, and improves workplace morale and productivity through reduced stress, absenteeism, lateness, turnover, fatigue and errors. The GPI report received good press coverage, and Nova Scotia's finance minister promised to consider this "progressive option" in the future. For full press release and to order report, please visit the GPI web site at Error! Bookmark not defined. The proposed clean up of Halifax Harbour can produce net benefits worth up to $1.4 billion over 60 years, according to a new GPI Atlantic study that considers the impacts of a cleaner harbour on tourism, property values, shellfish harvesting, labour income, taxes, environmental quality, marine ecosystem services and other factors. The study subtracted the capital and operating costs of proposed sewage treatment plants from the projected economic benefits of a cleaner harbour, and concluded that "the 'cost' of the plants is a very sound investment with a positive rate of return." The 60-page report, authored by GPI researcher Sara Wilson, and due for release in early July, also found that pollution prevention and source controls are essential to restore harbour quality. The study projects a 2% to 3% annual increase in tourism revenues, worth $9 to $14 million a year, as sewage discharge litter on harbour shorelines, as well as odours and floating debris diminish. Visit the GPI web site at Error! Bookmark not defined. for full text of press release; and see the publications section on the web site to order the full report. First drafts of the GPI Ecological Footprint analysis, Water Quality component, Greenhouse Gas accounts, and Forest accounts are all currently being revised for release in final form this summer. Watch the GPI web site for upcoming releases. Work is currently continuing on the Transportation, Income Distribution, Soils and Agriculture, Fisheries, Employment and Livelihood Security, and Air Quality components of the GPI -- all scheduled for completion in the fall of 2000. See the GPI web site for a full list of GPI researchers. GPI Atlantic gave evidence May 9-12 to the Nova Scotia Environment Act review panel; and on May 23 at the Halifax Regional Municipality's public hearings on a proposed by-law that would phase out use of cosmetic lawn pesticides over a period of four years. Invoking the "precautionary principle," which is enshrined in the Nova Scotia Environment Act and accepted both nationally and internationally, GPI Atlantic presented medical evidence to HRM Council in support of the proposed by-law. The precautionary principle states that when there is a danger of serious or irreversible harm to health or the environment, lack of scientific certainty should not be taken as a reason for inaction. GPI Atlantic submissions to Environment Act review are on the GPI web site at Error! Bookmark not defined. under "Articles and Press Releases". With an $11,225 internship from Environment Canada, GPI Atlantic researcher, Anne Monette, began work in June on the GPI Air Quality and Solid Waste components of the Genuine Progress Index, intended for completion by March, 2001. Halifax Regional Municipality is also a funding partner in the work, which will be guided by a steering committee of experts from Environment Canada, NS Department of Environment, HRM, and the director of the Clean Nova Scotia Foundation. Since the inception of the Nova Scotia GPI project, Statistics Canada has generously provided tremendous in-kind support in the form of ongoing advice and consultation on methodologies, data sources and analysis, review of draft reports and provision of detailed feedback, and access to data. GPI Atlantic is now working closely with the Canadian Policy Research Network in Ottawa in its quality of life indicators project, and with the Pembina Institute for Appropriate Development which is beginning work on an Alberta GPI. GPI Atlantic, CPRN, Pembina, and the Atkinson Charitable Foundation have jointly written to the Minister of the Environment and the National Round Table on the Environment and the Economy, expressing their support for a new federal initiative on integrated economic-environmental accounting, and their intention to work cooperatively. The Chief Statistician of Manitoba has requested and received a full set of GPI reports and materials; and GPI Atlantic and Newfoundland's Chief Statistician have discussed the potential for future cooperation. Newfoundland has gone further in developing community-level indicators than any other province. All these groups and initiatives share the goal of developing better measures of well-being and progress. GPI Atlantic looks forward to sharing information and resources, and to working cooperatively with like-minded initiatives across the country. by Joe Jordan, MP. The bill calls for the "development and periodic publication of a set of indicators of the economic, social and environmental well-being of people, communities and ecosystems in Canada." More details and a "Discussion Kit" are available from Mike Nickerson at sustain@web.ca (613) 269-3500, and at: Error! Bookmark not defined. CBC Radio featured stories on the Genuine Progress Index and interviews with GPI Atlantic on Information Morning shows across the country in the spring; and a one-hour phone-in commentary by GPI Atlantic researchers on the three Maritime budgets. · On June 28-29, representatives of Justice Canada and the National Crime Prevention Centre in Ottawa will come to Nova Scotia to visit the community GPI projects in Kings County and Glace Bay. · June: Testing of community GPI questionnaire, Statistics Canada expert review, and final revisions. · July - August: Data collection and administration of questionnaire for community GPI projects, Kings County and Glace Bay. · July: Release of final report and results of Soils and Agriculture component of Kings County GPI; July 18: presentation of results to Kings County farmers. · Fall: Data input for community GPI, with analysis and presentation of results to both communities scheduled for the winter of 2000-01. More crime is good for the economy. Higher crime rates and greater fear of crime produce more spending on police, prisons, courts, burglar alarms, security guards, surveillance equipment, theft insurance, hospital bills, and replacement of stolen goods. All that spending makes the GDP grow. The O.J. Simpson trial alone contributed $200 million to the U.S. GDP, and the Oklahoma City explosion fueled massive growth in the security industry as government buildings invested in high-tech surveillance and security. Imprisonment is one of the fastest growing sectors of the U.S. economy, growing at a rate of 6.2% a year since 1990 (compared to GDP growth of 3.5%). The prison-building industry now adds $7 billion a year to the U.S. GDP, with private prisons expanding to 27 states. An additional $35 billion a year is spent maintaining those prisons. In the last fifteen years the United States has increased prison spending by more than 230%, and the prison industry, with 523,000 employees, is now the 2nd largest employer in the USA, after General Motors. The U.S. security industry adds another $50 billion a year to the U.S. GDP, with schools now the biggest customers. For Canadians, the U.S. is increasingly our model of a "robust," "dynamic," "healthy" economy. Rarely do we ask: Just what is fueling that growth? Yet Simon Kuznets, Nobel Prize winner and principal architect of the GDP, warned 60 years ago that the GDP should not be misused, as it is today, as a measure of well-being. To assess well-being, Kuznets counseled, we should always ask: "growth of what and for what?" Since 1980, the U.S. prison population has more than tripled. Two million Americans are now behind bars, one out of every 135 U.S. citizens, the highest per capita rate of incarceration in the world (Chart 1). With just 5% of the world's population, the U.S. today houses 25% of the world's prisoners. Black males have a one-in-three chance of spending prison time in their lives. Is this our model of a "healthy" society? Since Republican presidential frontrunner, George W. Bush, took power in Texas in November, 1994, the prison population there has nearly quadrupled, from 41,000 to 150,000. Incidentally, the USA's two million prisoners do not count in the country's highly touted low unemployment rates. A recent British commentary noted that the U.S. economic investment in a system requiring more prisoners to maintain profits is now so great, that U.S. governments can no longer reverse the trend or seek alternative ways of administering justice. Here are some examples of the economic stakes in the booming prison industry. A handful of leading firms, like Goldman Sachs and Merrill Lynch, write nearly $3 billion in prison construction bonds each year. The Sodexho Marriott Corporation, which provides food services on 900 campuses throughout North America, is one of the leading investors in the U.S. prison-building industry, holding 17% of stock in Corrections Corporation of America, the world's largest for-profit prison company, and another 9% of stock in Prison Realty Trust, CCA's sister company. Lucrative food contracts are a likely motive. On many campuses U.S. students are now boycotting Marriott food services, and urging university administrations to change food-service providers to encourage Marriott to divest its prison holdings. Societies less dependent on imprisonment literally have more policy options. 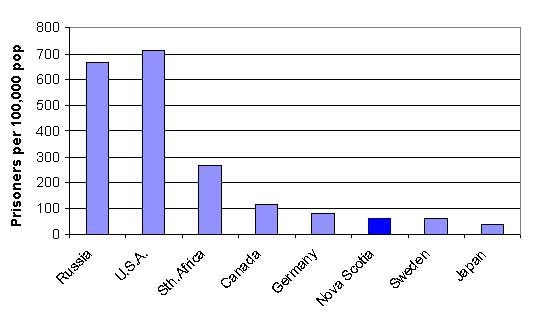 Nova Scotia imprisons its citizens at less than one-tenth the U.S. rate, and has less than one-sixth the rate of serious violent crime. Having a more peaceful and secure society is an economic disadvantage according to conventional measures, and slows the rate of GDP growth. But with less economic reliance on imprisonment, Nova Scotia has recently embarked on an alternative "restorative justice" initiative, in which the criminal is brought together with victim, family and community members to determine appropriate "restoration," and promote healing. Might "economically backward" Nova Scotia be a model here for its big southern neighbour? In the Genuine Progress Index, quite simply, crime is measured as cost not gain. Unlike measures of progress based on the GDP, less crime makes the GPI go up. Indeed, as with pollution, sickness, greenhouse gas emissions and other activities, less is sometimes better in the GPI. Though this is heresy for GDP-based measures of well-being, in which more is always better, the GPI approach is really "street-sense" economics. What is saved through less spending on prisons and security devices can be invested in more productive activities like health, education and culture. GPI Atlantic found that crime presently costs Nova Scotians $1.2 billion a year (or $3,500 per household) in victim losses, lost production, and spending on prisons, police, security devices, theft insurance and other "defensive" expenditures. The average Nova Scotia household spends $800 a year in higher prices due to shoplifting, security costs and other expenses, amounting to 2.6% of their annual consumption budget. Insurance fraud costs Nova Scotian households an additional $200 a year in higher premiums, amounting to about 15% of total insurance premiums. Though still far behind the U.S. in per capita crime spending, Nova Scotian crime rates have tripled since the early 1960's and crime spending has escalated dangerously. As a step beyond a simple-minded current income statement like the GDP, and towards a cost-benefit balance-sheet approach to accounting, the GPI therefore separates out the costs of crime as an indicator of growing social insecurity. The GDP is like a policeman who simply adds up all the street activity he observes -- a lady walking her dog, a thief breaking into a car, children playing, a thug beating someone up -- all are equal. If the policeman observes 327 street activities today, compared to 320 yesterday, he takes pride in his achievement of recording more "growth." We expect more of our policeman, and we should expect more of our policy makers. Both have the ability and duty to distinguish benefit from harm -- to protect and nurture innocent and beneficial activity, and to prevent harm and injury. Simply counting crime as cost rather than gain, naturally focuses policy attention on crime prevention and on the social and economic determinants of crime, rather than on punishment, imprisonment, and the "profits" they yield. Reducing the economic reliance on imprisonment can also allow the exploration of alternative methods of administering justice, like Nova Scotia's restorative justice initiative. And recognizing its advantage over the United States in having a more peaceful, harmonious and secure society, Nova Scotia might question its gradual movement towards the U.S. economic model, and instead pursue a more humane and self-reliant development strategy of its own. For more information see GPI Atlantic's Cost of Crime report (220 pages), or the shorter report summary (12 pages), available through the GPI web site at Error! Bookmark not defined. Members and GPI News subscribers receive a 25% discount on all GPI publications. The more trees we cut down, the faster the economy grows. We currently value our forests only for their cut timber value, while ignoring their value as natural capital assets. In relation to natural resources, the GDP confuses income with wealth, and counts capital depreciation as gain. Have we learned from past mistakes? Ignoring the depletion of our Atlantic ground-fish stocks led to a devastating resource collapse, economic disruption and employment losses. Yet, recently, the National Round Table on Environment and Economy warned that Maritime wood-lots may be on the verge of an industry collapse analogous to that which preceded the fisheries crisis. So long as our economic accounting system not only fails to bring this warning into the policy arena, but actually sends the opposite message, we are likely to repeat past errors and continue to deplete our precious resources. By contrast, the Genuine Progress Index treats natural capital in the same way that conventional economic measures regard manufactured capital. The GPI examines the full range of forest functions and values, and assesses whether these values and the "health" of the forest resource is being maintained or depleted. The GPI counts not only standing timber value, but also the value of forest functions like protecting soil quality, watersheds, and habitat, regulating climate and sequestering carbon from the atmosphere, and providing recreational and spiritual sustenance. It assesses alternative harvesting practices according to their ability to maintain the full range of forest functions, which, in turn, enhance the timber value of the forest. "Sustainable" development requires not only that we live within the carrying capacity of our natural resource base, but also that we conduct our economic activity in such a way that the next generation will not be worse off than we are at present. The GPI provides a practical means to assess progress towards sustainable development, and an early-warning system of potential resource depletion that can allow timely and graduated policy responses to prevent crisis and resource collapse. In fact, the GPI recognizes that healthy natural resources are the basis of a healthy human economy that is completely dependent on resource flows for every aspect of its activity. Here are two examples of the practical policy implications of the GPI approach, based on trends in age and species diversity from the GPI forest accounts currently being developed and scheduled for public release in September, 2000. Future issues of GPI News will explore the economic value of other forest functions. Intensive clearing and cutting of Nova Scotia's forests has been under way for two centuries. But as recently as 40 years ago, when the province's forests were by no means pristine, 24% of Nova Scotia's forest area had trees more than 80 years old. Eight percent of Nova Scotia forests had trees more than 100 years old. Today, less than 2% of Nova Scotia's forest area has trees more than 80 years old, and trees over 100 years old have almost completely disappeared (0.15% remaining) (Chart 2). We have lost almost all our old trees, and less than 1% of "old-growth" forest remains in the province. In the last eight years alone, the provincial area clear-cut has doubled. On a tree by tree basis, even in simple market terms, our forests are worth less. We have less wide diameter trees and less clear, rather than knotty, lumber, both of which would fetch premium prices. Our forests today are suitable primarily for pulp and paper, which provide far less employment per board foot than saw-log industries with more value-added potential. The recreation value of our forests has declined, with serious implications for the burgeoning eco-tourism industry. The carbon sink value of Nova Scotia forests has also declined, because older trees store more carbon. As Canada strives the meet the Kyoto targets and to reduce its greenhouse gas emissions to 6% below 1990 levels, this loss of carbon storage has serious economic implications. The loss of canopy cover in clear-cuts provides no protection against rainfall and thus accelerates soil nutrient losses and erosion, which in turn affects future forest productivity. In sum, while the GDP records the increased rate of clear-cutting as economic gain, the loss of old trees has seriously compromised the value of Nova Scotia forests. The decline in tolerant hardwoods has also diminished forest resilience and increased susceptibility to insect infestation and disease, which in turn justifies more clear-cutting. Studies of the major spruce budworm infestation of the 1980's found that spruce and balsam fir losses to the spruce budworm were significantly less when more hardwoods were present. Balsam fir stands with less than a 40% hardwood component sustained an average of 58%-71% defoliation, whereas stands with greater than 80% hardwood suffered only 12-15% defoliation. The studies concluded that mixed balsam fir – hardwood forest stands with more than 40% hardwoods present could substantially reduce losses during budworm outbreaks. Reduced hardwood content and increased even-aged management in Nova Scotia forests have likely diminished the diversity and population of birds and parasitoids that are natural predators of the spruce bud-worm, thereby increasing susceptibility to infestation and defoliation. Other studies have concluded that, because the bud-worm only attacks trees of particular ages, prior clear-cutting and subsequent even-aged management made the 1980's infestation far more devastating than earlier recorded infestations that were part of the natural forest succession in multi-aged, multi-species forests. From the GPI perspective, the increasing loss in diversity therefore represents a loss in economic value that may manifest directly in increased future costs. Current forest accounting methods used by Departments of Natural Resources throughout the country do not value forest diversity or record this critical loss of age and species diversity over time. "Sustainability" is measured by simply balancing "depletions" from harvest, fire, insects and disease against "regeneration" (natural growth plus silviculture). These purely quantitative accounts allow a multi-age, multi-species old-growth forest to be replaced by a single-age, single-species plantation of seedlings, without any loss of value being recorded. Promotion of silviculture as a tool of "sustainability" can therefore be seriously misleading. The GPI explicitly includes qualitative as well as quantitative measures as vital indicators of forest health that can provide a more accurate and comprehensive portrait of sustainable resource use. The policy implications of these preliminary GPI forest results are obvious. Proper resource accounts will encourage harvesting methods that sustain the full range of forest functions and values, and thus enhance the long-term timber productivity and value of the forest as well. With that explicit policy objective, tax breaks can be given for selection harvesting techniques that protect age and species diversity in standing forests, with clear-cutting correspondingly penalized in accordance with its long-term costs. For more information, see Introduction to the GPI Natural Resource Accounts in the "Publications" section on the GPI web site at Error! Bookmark not defined. and watch for the release of the GPI Forest Accounts, authored by Sara Wilson, in September. Members and GPI News subscribers receive a 25% discount on all GPI publications. Measures of progress based on the GDP value only paid work. Eating fries at a fast-food take-out is recorded as economic "growth" and progress. The time we spend cooking our own meal has no value in our conventional measures of progress. If we hire someone to clean house, the GDP goes up. Marry our housekeeper, and the GDP goes down. Much of what is recorded as "growth" is simply a shift from the unpaid household economy to the market economy. But this is not just an accounting quirk. The lack of value assigned to unpaid work has serious implications both for policy and for quality of life, affecting the persistent gender wage gap, high poverty rates among single mothers and their children, the decreasing time parents spend with their own children, the decline in home-cooking and its health consequences, and the growing time stress that comes from the struggle to juggle job and household responsibilities. Future issues of GPI News will explore these issues, and details are available in two GPI reports, The Economic Value of Civic and Voluntary Work and The Economic Value of Unpaid Housework and Child Care, that can be ordered through the "Publications" section on the GPI web site at Error! Bookmark not defined. (25% member discount). Here we take a very brief look at just one direct policy implication of valuing unpaid work as reflected in the GPI results -- the potential to reduce time stress through redistributing work hours. In the last 40 years, women have doubled their share of participation in the paid labour force. But time use surveys indicate that women still do nearly twice as much housework as men, just as they did 40 years ago. While women's labour force participation is rightly seen as a sign of increased freedom in the market economy, women's loss of free time has gone unnoticed in our conventional measures of progress, because unpaid work is unrecorded, invisible and unvalued in the market statistics. Not surprisingly, Statistics Canada reports that working mothers are the most time-stressed demographic group, with more than one-third reporting "severe" levels of time stress. On average, working mothers put in a 75-hour working week when paid and unpaid work are both included. For the first time, a new Statistics Canada study has definitively linked longer working hours with increased health risks. Women moving to longer hours were more than four times as likely to smoke more than women working shorter hours. They were twice as likely to increase their rate of alcohol consumption, and 40% more likely to decrease their level of physical activity and to experience an unhealthy weight gain. Longer work hours therefore increase the risks of cancer, heart disease, hypertension, diabetes and other serious illnesses. Studies also show more subtle and indirect health consequences from overwork. Time use surveys show parents spending less time than ever with their own children, with potential effects on the psychological and mental well-being of youth. Long hours can also increase anxiety, strain and irritability, and hasten family breakdown. There is a greater likelihood of sleeplessness, fatigue and poor eating habits. Nova Scotians spend 30% less time in their kitchens than they did eight years ago, and they eat more fast food. A recent Harvard University longitudinal study found that children eating at home with their parents have healthier diets and health outcomes into adulthood than those who eat out more. In light of the doubling of obesity rates among both adults and youth in Canada since 1985, this invisible shift from the household to the market economy may carry long-term health consequences. The invisibility of unpaid work has particularly serious consequences for women, who still do most unpaid work. But Statistics Canada time use surveys show sharply increased levels of time stress for both sexes and all age groups in the 1990's. More Canadians are working longer hours than ever, with the highly educated and highly skilled in particular putting in more unpaid overtime, as firms and governments downsize and expect higher productivity from a reduced staff of their most valued employees. So long as unpaid household and volunteer work, as well as free time, remain unmeasured and unvalued in our measures of progress, this growing time stress, and its consequences for personal health, family breakdown, and community service, remain masked. And the increasingly intense struggle to balance job, household and volunteer responsibilities will remain a private, domestic issue producing family tensions, blame and recrimination. Once visible and measured, policy attention can shift to total work hours, and both the problem and the solution become social issues. The Genuine Progress Index does assign explicit value to both paid and unpaid work, and to free time. The GPI analysis notes that while more Canadians are working longer hours than ever, an increasing number also cannot get the hours they need to make ends meet. With the growth of insecure, temporary, casual jobs, the rate of involuntary part-time work has risen steadily to nearly 40% in Atlantic Canada. In other words, the standard workweek is declining, with the increasing polarization of hours identified by Statistics Canada as the main source of growing income inequality in Canada. Both overwork and underemployment are stressful. One Japanese study found that the underemployed and the overworked had equally elevated risks of heart attack. The Japanese word "karoshi" actually means "death from overwork." It doesn't have to be this way. We can learn from excellent working models of successful efforts to improve the balance between paid and unpaid work, and between work and family life. In the Scandinavian countries, family-friendly work arrangements have become more important priorities in collective bargaining than wages. International time use studies have shown that the Danes now have 11 hours more free time per week than Canadians. The Netherlands reduced its unemployment rate from 12.2% to 2.7% by reducing overall work hours, and now has the lowest annual work hours of any industrial country. Dutch workers put in an average of 1,370 hours of paid work per year, compared to 1,732 for Canadians, the equivalent of 10 weeks less per year. The USA now has the longest working hours of any industrialized country in the world, having surpassed the Japanese, another factor spurring rapid growth rates in the U.S. at the expense of the quality of life of its citizens. A Dutch law prohibits discrimination against part-time workers, ensuring them equal hourly pay, pro-rated benefits, and equal opportunity for career advancement. A bill is now before the Dutch parliament to give workers the right to reduce their work hours, a right already enshrined in most Dutch collective agreements. Holland now has the highest rate of part-time work among OECD countries, but part-time work is considered "good work" in that country, and the rate of involuntary part-time work is just 6%, less than one-sixth the rate in Atlantic Canada. Shorter work hours have been shown to increase productivity dramatically. 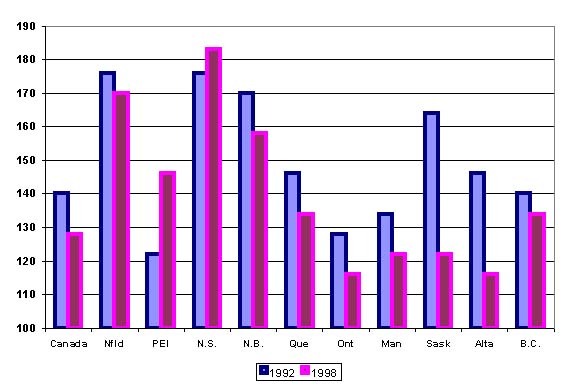 In contrast to North Americans who are working longer hours, the Dutch, Danes, Norwegians, French, Italians and other Europeans have actively reduced work hours both in order to spread the work more evenly and thus to reduce unemployment and underemployment as well as overwork, and also to improve work-family balance. Studies show the unemployed have a reduced life expectancy and suffer significantly more health problems than people who have a job. The reduction and redistribution of work hours can therefore improve health for both the under-worked and the overworked. Atlantic provincial governments could begin shifting the focus in this direction in a simple cost-free way -- by giving annual honorary awards to businesses that institute family-friendly work arrangements, including flexible work hours, job-sharing arrangements, and the right to reduce working hours without career penalties. Beyond that, legislation on the Dutch model could provide an alternative to the American pattern of overwork that increasingly dominates this continent. In response to the announced intention of the Nova Scotia government to cut the provincial civil service, GPI Atlantic recently published a 30-page report advocating savings through voluntary work time reduction rather than layoffs. Drawing on successful European and North American work reduction initiatives, the report demonstrates the potential for an 8.3% savings in labour costs without layoffs, while reducing work stress and improving work-family balance for employees. The report, Voluntary Work Reduction in the Nova Scotia Civil Service, illustrates the direct policy implications of the GPI work, and is available through the "Publications" section of the GPI web site at Error! Bookmark not defined. (25% member discount). This summer, GPI Atlantic has a larger staff than ever before, with 27 full-time employees, due to a remarkable and unanticipated new development. Since the launch of the Nova Scotia Genuine Progress Index in 1997, the strongest interest in the project has been expressed by local communities who are urgently looking for ways to assess their well-being accurately, and to measure their progress genuinely. It is at the level of local community that "the rubber really hits the road" in terms of quality of life. Communities know viscerally if they are getting safer or not, if job security is growing or not, if people in need are being cared for, if the quality of their air is improving or getting worse. They also know that the economic growth measures conventionally used to assess well-being don't tell the whole story. And they yearn for community development strategies that address the issues that matter to them. In early 1999, Nova Scotia Citizens for Community Development Society, a non-profit group, approached GPI Atlantic to assist in developing community-level genuine progress indicators. The problem is that, while the provincial GPI is being developed from existing and established data sources, community-level data simply do not exist. As a result, GPI Atlantic has now spent more than a year working with more than 40 community organizations in Kings County, Nova Scotia, to determine appropriate indicators, and to develop a questionnaire to gather the data needed for a community Genuine Progress Index. That questionnaire is now complete, and includes many questions on employment, voluntary work and care giving, population health, peace and security, and impacts on the environment. In February, 2000, the National Crime Prevention Centre recognized that the GPI indicators could help communities identify the social and economic causes, costs and impact of crime, and develop annual benchmarks of progress towards creating more peaceful and secure communities. With funding from the NCPC's Business Action Program, a second community-level GPI has now been launched in Glace Bay, a former coal-mining town with very high unemployment, in industrial Cape Breton. Having undergone detailed review by Statistics Canada experts, and having been tested in the community, both Kings County and Glace Bay are now poised to administer this questionnaire and to collect the data for their Genuine Progress Indices. Nine Glace Bay residents, and nine Kings County residents will be working full-time through the summer of 2000 gathering the necessary data. Nine more staff are continuing research on the provincial GPI this summer, partly on a volunteer basis, and with some financial support as funds become available through your memberships and subscriptions to GPI News. We anticipate the data input to occur in the fall of 2000, after which the results will be analyzed and reported back to both communities. From that process a set of annual benchmarks of progress will be developed. The Population Health Research Unit in Dalhousie University's Medicine Faculty recently expressed strong interest in working with GPI Atlantic in the data analysis phase, as the data will provide information on the determinants of health not previously available at the community level. In the second year of the community GPI project (2001-2002), GPI Atlantic, the NS Citizens for Community Development Society, and local residents will bring proposals and recommendations to policy planners and development agencies based on the GPI results. This information will assist in crafting development strategies that build on local strengths and overcome identified weaknesses revealed by the data. In year three (2002-2003), the community GPI will be packaged for "export" to other interested communities. Kings County and Glace Bay are designed as "pilot projects" for other communities. Put very simply, the community GPI can assist communities in setting clear goals, planning a better future for their children, and in measuring their progress towards those goals. GPI Atlantic, the N.S. Citizens for Community Development Society, and residents of Glace Bay and Kings County, are willing to assist any other community interested in developing local community-level Genuine Progress indicators. A package of about 250 pages on the community GPI, in PDF format, will be available through the GPI web site at Error! Bookmark not defined. at the end of June, 2000. It will contain the completed questionnaire, reports to community meetings revealing the indicator selection and questionnaire development process, community GPI brochures distributed to residents of Glace Bay and Kings County, and the completed report on the Kings County soils and agriculture indicators and results. .
As results from Glace Bay and Kings County become available, as annual benchmarks of progress are established, and as the community GPI projects continue to develop and unfold, we will continue to keep you informed in the GPI News, and in the "Community GPI" section on our web site. The way we measure progress can significantly shift the policy agenda from its present purely economic focus to a broader view of well-being and quality of life that reflects our shared aspirations as human beings. If we are to shift course from some of the destructive patterns we currently embrace and to plan a better future for our children, we can begin by counting and valuing what really matters. As a non-profit group, GPI Atlantic depends entirely on donations and funding support. Most of the GPI research, data collection and analysis, and community development work is provided on a voluntary basis. Your financial support will enable our staff to devote more time and effort to their GPI work. Donations to GPI Atlantic (Box 489, RR#1, Tantallon, N.S. B0J 3J0, Canada) will be gratefully acknowledged. Please share this first complimentary issue of GPI News with your friends and associates, and encourage subscriptions and memberships ($95 individual and non-profit, $190 corporate and government). Members receive future issues of GPI News and a 25% discount on all GPI reports and publications. Thank you for your support and your interest. GPI Atlantic is a non-partisan, non-profit group committed to providing, advice and materials to any group or party willing and interested in applying GPI data and results to the policy arena. Any index of progress must answer the question -- "progress towards what?" and is therefore value-based by definition. At the inception of the project in 1996-98, GPI Atlantic spent 15 months consulting with government, independent experts, and community groups on appropriate indicator selection, with a view to ensuring that the indicators reflect consensus values in Canada. All the data used in our reports are from Statistics Canada and other official and reputable sources. The selected indicators reflect concerns shared by all political parties, regardless of ideology, and we have tested them to ensure that no political party has an ideological or partisan objection to any value embodied in the GPI indicators. In many cases, the conclusions suggested by the indicators are surprising and go against the grain of conventional wisdom. Providing practical policy alternatives is the strength of the GPI. GPI Atlantic is registered as a non-profit society with the Nova Scotia Registry of Joint Stocks. Financial statements and information on tax deductions for donations are available to members on request. This is about choosing a new order. Do you feel that growing an ever larger economy will solve the problems of our age? Or, do you believe that solutions will be found by setting our sights on long term well-being? That is, by aiming to involve everyone who needs sustenance in a system that: manages necessary materials in continuous cycles, uses renewable energy and eliminates harmful waste? Which goal do we want to pursue? Which do you feel people would pick if we had a democratic choice? This choice could be offered in the upcoming Canadian federal election. As a goal, for its own sake, expanding production and consumption will not solve the problems growing around us. No matter how many nations get drawn into "free trade" agreements to feed the expansion, the Earth will not get any bigger. We need a better way to live. It is proposed "that the Green Party of Canada deliver the Question of Direction to Canadians in the 2004 Federal Election." If you would like to see this choice offered, please help to move it forward. a) Forwarding this message to your network of acquaintances. b) Joining with local activists to promote the Question of Direction, in general, and in the upcoming election, in particular. c) Contacting the Green Party (contact info. below) and encouraging them to make the Question of Direction a clear message in the election. d) Joining the Green Party to give weight to your interest in asking the Question of Direction. e) Actively offering the choice to the people in your community by running as a Green Party candidate. Membership in the Green Party of Canada is $10 to $25. If the prospect of offering this fundamental choice moves you to join, or to run, mention the Question of Direction in your communication. Phone (613) 562-4916 or toll free at 1 (866) 868-3447. "The goals we pursue are the seeds from which our future grows."